Our Vancouver Canucks’ game limousine service is fast, affordable and always on time. A limousine is every rock stars favourite way to travel to a Canucks game. Arrive in style to the front entrance and depart quickly and avoid traffic and parking lot jams. We make sure you get there in comfort and style. Never worry about finding and paying for parking ever again. Let us be the designated driver so your entire group can enjoy themselves at the game. There is nothing we enjoy more than making sure that your big Vancouver Canuck’s Game night is safe, reliable and fun! Our mission has always been to provide the highest quality of service and Vancouver’s most exquisite limousines at affordable rates. We keep an close eye on all of Vancouver’s limousine companies so that we can always remain one step ahead of the game. Our fleet, prices and service are simple unmatched by any other limousine operator. Our professionally trained and experienced chauffeurs will be available for any required length of time, and will perform any extra duties if needed. We can pick up everyone in your party at their houses and deliver to the game in a reliable and timely fashion. Our fleet of vintage limousines includes a classic 1938 Buick Stretch Limousine, and a 1939 Cadillac Limousine. These represent Vancouver’s finest vintage limousines and they will look great in all your Vancouver Canucks game day photos. 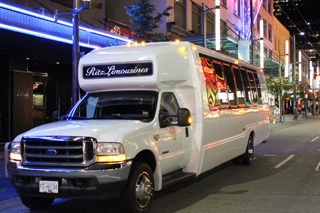 Ritz Limousines offers Vancouver Canucks game transportation services throughout the Lower Mainland and Greater Vancouver Region including Whistler. Our limousine service area includes: Vancouver, Richmond, North Vancouver, West Vancouver, Horseshoe Bay, Lions Bay, Burnaby, New Westminster, Coquitlam, Port Coquitlam, Port Moody, Pitt Meadows, Maple Ridge, Mission, Surrey, White Rock, Delta, Ladner, Tsawwassen, Langley, Abbotsford, Cloverdale, Aldergrove, Chilliwack, Squamish and Whistler. It’s never been easier to book limousine services than with Ritz. Call, click or email today! We have a full service support staff waiting to take your calls and answer any questions you may have about our limousine fleet, service and rates. For more information about the Vancouver Canucks or to order Vancouver Canuck’s tickets visit the Vancouver Canucks website.